We’re already 3/4th the way into 2015, only a few short months away from 2016, but one trend has been clear since the start of this year, consumers are giving more and more consideration to the “outer” look of their phones, and not just to the design (and abhorrence of thick phones), but more importantly to build material. In an age where almost all the internals of flagship devices are identical, save for a Micro SD slot here, or a removable battery there; phone design and build material gain even more importance as it’s stopped being a “bonus” if the phone happens to look good, or feels solid; instead it has become yet another way to differentiate from the rest of the pack, and sway potential customers. Only last year consumers and reviewers tore apart Samsung’s for using “cheap plastic” and “poor quality materials” in their flagship Galaxy S5. Thankfully Samsung learnt their lesson, and came out swinging with this years range of devices, from the Galaxy S6 to the Note 5, along with everything in between; one thing was clear, plastic no longer had a place in Samsung’s flagship lineups. Instead Samsung committed to a range of sleek glass and metal devices, with curves and edges that if nothing else, added a definite wow factor to their devices. Sony, who have long ago embraced metal and welcomed it into their design language, went a step further with this years Z5, adding a polished mirror glass surface to the back of the phone, which undeniably enhances the premium effect of glass and metal. 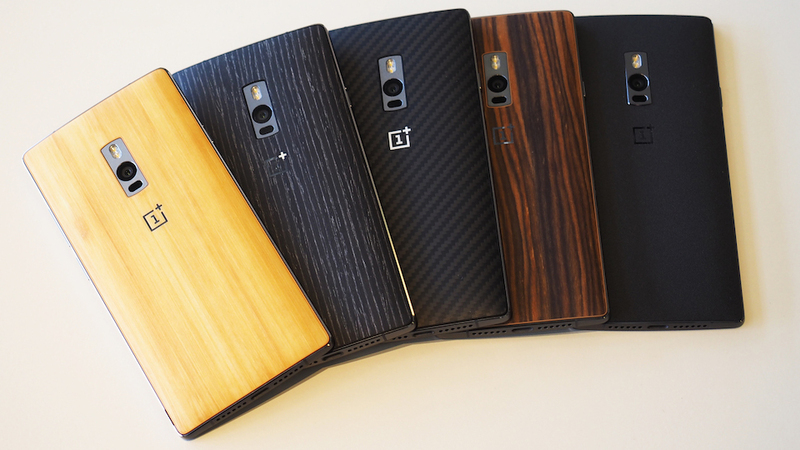 Even the budget friendly flagship, the One Plus 2 ditched last years plastic build for a more solid metal frame/buttons along with a selection of wood rear covers, ranging from bamboo to rose-wood, as well as a Kevlar carbon fiber back as well. The list of “premium” bodied flagships in 2015 goes on and on, from Apple continuing with the design of the iPhone 6 and 6+, to Huawei’s Mate S (seen above), with its full metal body design and smooth curves; as well as of course one of the original full body metal phones designs, the HTC One (M9). In fact one of the few flagship devices release this year that didn’t go with either metal or glass, was the LG G4, which made up for its plastic build with a range of genuine leather backs, which more than compensated for the plastic frame (regardless of how poorly the leather aged with time). With all that in mind, the fact that Microsoft have continued to stick with polycarbonate in their upcoming flagships is certainly questionable, no matter the “quality” of polycarbonate , customers will inevitably equate it with plastic. When Nokia released the Nokia N9, their first polycarbonate phone (and certainly one of the first phones to embrace the color revolution of smartphones), it was nothing short of innovative in terms of design, and build quality. Of course that was a different time, when the iPhone 4S was still one of the few phones to incorporate glass into their devices (besides the screen obviously). Since then times have changed, yes I certainly stood by the Lumia 920 (even with its weight issues), declaring that it was an obvious evolution to the Lumia family, and of course at the time everyone else was still using cheap plastic in their phones. Since then however Nokia experimented with incorporating a mix of metal and polycarbonate into their phones, and it was definitely a success; starting with the original Lumia 925 which came with a slim profile and a metal frame, to the Lumia 930 and 830 which carried the same tradition (not to mention the beautiful limited edition gold variants of them). With all that has been said, and after comparisons I can’t help but feel like the 950/950 XL are a disappointment (I stress that I mean this in terms of design/build and not the actual phone), as we have been conditioned to expect a certain amount of metal or glass in the most elite of phones. In my mind the Lumia 950 and 950 XL are closer to the Lumia 640 XL (seen above), than to previous flagships such as the 930, 830 or even the 920. With so many Lumias floating around, and so much polycarbonate and plastic, it seems unfair that the flagship devices for Windows 10 Mobile, and Microsoft’s first proper flagship in well over a year is underwhelming to look at. Like anything valuable, the essence of said value is from its scarceness, and it seems that the abundance of plastic/polycarbonate Lumias with similar designs have diluted the value of the once premium polycarbonate build. I dropped my 930 only once and got a deep scratch in the metal frame. Last week my brothers daughter dropped my 630 at least 5 times and the phone still looks like nothing happened. Conclusion: plastic is the better material for daily usage. Allmost all those premium-material phones are put into (ugly) protection cases or bumpers. So why buy a nice looking phone when you have to hide it all the time? Have we? I wouldn’t be so sure about that. But if indeed we have, then I think it’s even more important for someone to buck the trend. Look at what’s happening in the PC space, where so many laptop OEMs are basically copying the MacBook Air and Pro, and distinctive designs are getting few and far between. Do we really want the same thing in the smartphone market? Besides, as you yourself acknowledge, there are flagships out there that use materials other than glass and metal – OnePlus 2, LG G4 and Moto X, to name a few – so clearly those aren’t the only two materials that can feel “premium”. What, then, is the basis for singling out polycarbonate as the only non-metal/glass material that isn’t premium? Is it simply because plastic phones *can* feel cheap? If I may once again draw parallels with the PC market – ThinkPads are made mostly of various plastics, at least on the outside, yet they’re regarded as some of the most solid and well-designed laptops available. In fact, I affectionately call my black Lumia 920 “the ThinkPad of smartphones”. You mention the 925, 830 and 930 as examples of Nokia using a combination of metal and polycarbonate. Personally I find those to be among the most boring Lumias to date. The 830 and 930 in particular are derivative designs, while the 925 at least retains some class from its older brother. You say customers expect at least some metal in their phones, and indeed the 925 was a direct response to initial complaints about the 920 not having any, but haven’t Nokia and Microsoft managed to prove those naysayers wrong since then? With even Apple jumping on board (if only briefly) with the iPhone 5c, don’t you suppose people have learned that plastic can be a premium material too? I think they have, and moreover I think many people realise the objective benefits of polycarbonate over metal and glass as well. There are certainly some questionable design choices about the upcoming Lumias, but I vehemently disagree that the choice of materials is one of them. Like it or not, but polycarbonate is an important part of the Lumia design, and I’m happy Microsoft is keeping it alive. To put my main point another way – is, to quote the headline, “a World of Glass and Metal” really what we want? What a dumb article ..seriously. Change Your avatar . . . Seriously ! I have to agree, they look ok to me and I want to see one in the flesh before passing judgement of “how cheap they look” or not! We will see…. Tend to agree with other commenters here, there is nothing wrong with polycarbonate per se. The 920 was a classy, heavy, tank of a phone and other good examples have followed. If the 950/XL feel rock solid in hand, they might not be bad at all, perhaps the contrary. So I’ll wait and see how they look and feel in my own hands. Having said that, the rumored Surface phone will most likely appeal more to those who think metal is the way to go. Sure polycarbonate is a downgrade in terms of premium look and feel from metal and glass but it has its advantages.